Without collateral does not mean without security – When a financial institution is offering you a loan without collateral it does not mean that you or your parents cannot be held accountable for the loan. The guarantee papers have clauses where in the banks ensure that they can take over the personal assets of your parents in case there is a non-repayment of loan. So on a broad scale all loans are backed by your parent’s personal assets. Fixed Interest rate– Fixed interest rate is a misnomer. All financial institutions have a variable rate – Base Rate + Interest spread. All banks are governed by MCLR – Marginal cost of lending rate that is the cost of funds to the bank. In case the MCLR increases so does your interest rate. For NBFC they work on CLR – Commercial lending rate. The interest of the loan is linked to this rate – CLR +/- Premium/Discount. When the CLR increases for the NBFC the interest rate to the customer would increase. 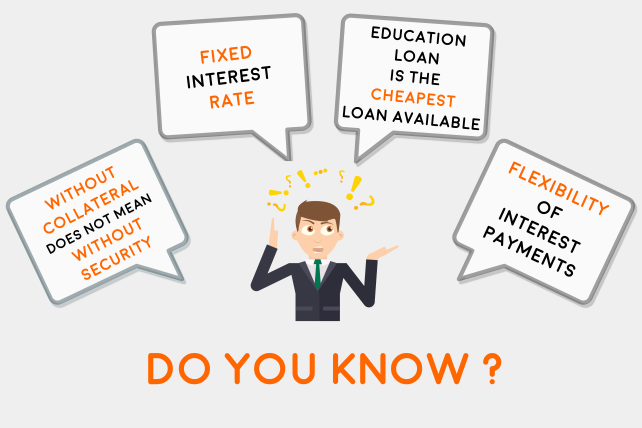 Education loan is the cheapest loan available – With unlimited interest adjustment against income tax under provision of section 80E, RBI has ensured that education loan is the cheapest net costing loan available in the market. Parents are incentivized to ensure that there is no hindrance on the child’s education due to non-availability of loan. With 80E tax deductions the net rate of interest comes at around 8 -9%. Flexibility of Interest Payments – The student loan is one of the most flexible products when it comes to interest payments. The loan is structured such that repayments would start only when the student starts earning which is after 6 months/1 year of the completion of the course. ← List of Courses for which Student can apply for an Overseas Education Loan?